Multiple Sclerosis: A Mechanistic View provides a unique view of the pathophysiology of multiple sclerosis (MS) and related disorders. 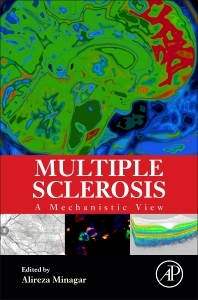 As the only book on the market to focus on the mechanisms of MS rather than focusing on the clinical features and treatment of the disease, it describes the role of genetic and environmental factors in the pathogenesis of MS, the role of specific cells in the pathophysiology of the disease, and the pathophysiology of inflammatory and neurodegenerative disorders related to MS. The book provides discussion of neurodegeneration and neuroregeneration, two critical emerging areas of research, as well as detailed discussion of the mechanisms of action of the approved and investigational drugs for treatment of MS and the emerging role of magnetic resonance spectroscopy (MRI) in investigations into MS. It is the only book on the market to offer comprehensive coverage of the known mechanisms of MS and related diseases, and contains contributions from physicians and researchers who are worldwide experts in the field of study. Do “gain-of-function” changes affect susceptibility to MS? Do ADEM and MS represent a part of immune-mediated spectrum of demyelinating disorders? Dr. Alireza Minagar is Professor and Chairman of neurology at LSU Health Sciences Center in Shreveport, Louisiana. As a graduate of Department of Neurology at University of Miami, he did a two-year fellowship in multiple sclerosis and clinical neuroimmunology at the Multiple sclerosis Center of University of Miami. Dr. Minagar has significant interest in pathophysiology and neuroimaging features of the inflammatory disease of human central nervous system, in general, and multiple sclerosis, in particular. His life-long passion is to better understand interactions between the inflamed endothelial cells and other cellular components of blood. Dr. Minagar strongly believes in team work and constantly works with other neurologists and neuroscientists around the globe. He has published more than two hundred manuscripts in peer-reviewed journal and textbooks on multiple sclerosis and other neurological diseases.